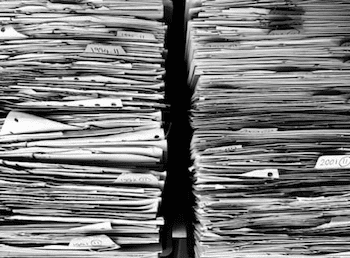 Businesses are often faced with the task of record retention. Whether you’re in the healthcare field, hospitality or any other kind of business, deciding how long to keep certain records is key to maintaining data safely and securely. And although there are mandates for many types of organizations, companies around the country are continually working to ensure their confidential information stays that way—and this can be an arduous task with the constant threat of breaches. Creating a retention schedule, and thus, a shredding and destruction schedule, can save your organization time and money and decrease the risk of data theft. Nearly every organization has an area where records and paperwork are stored. Even those companies who’ve gone digital still have some documentation that needs to be retained. But storing them beyond their expiration and usefulness becomes clutter. Purging outdated records not only clears up space in your office but also ensures that sensitive information doesn’t fall into the wrong hands and become a liability for your company. Shredding your own business documents means that someone in your company has to manage that task continuously. This becomes a time-consuming job and can be a security risk. There is an exponential amount of time saved when you partner with a shredding provider who will manage all of your shredding needs, including hard drive and other device destruction, on a regular schedule. Certified and insured shredding providers will come to your office and shred all unnecessary records onsite, so the documents never leave your sight during the process—this provides the peace of mind that each and every document has been permanently destroyed. No matter what business you’re in, you can create a records retention and destruction schedule that will best fit your needs. Taking into account any state or federal regulations that relate to your industry, develop a document life cycle that will ensure you have timely, relevant information for your records and that you’re not keeping anything past what is necessary. Once you’ve done this, talk to your shredding provider to create a customized schedule, which could be weekly, bi-weekly, monthly, quarterly or whatever is the most appropriate for the number of records you have. All Points Mobile Shredding is a full-service shredding and device destruction company. We’re family owned and operated and have been serving South Florida businesses for more than two decades. Give us a call today at 772.283.4152 to set up your shredding schedule or fill out a quote request form.